Thank you all for being my quilting community. 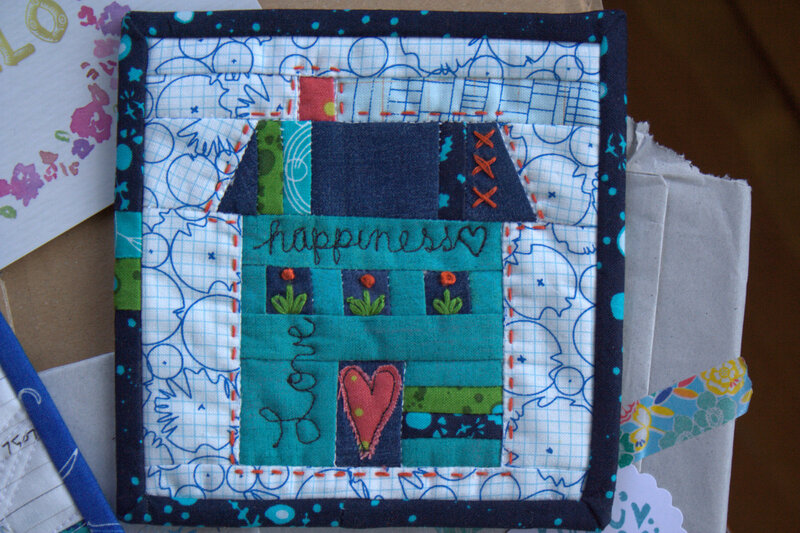 I have so much gratitude in my heart today, after another fun Periscope #honestcraftroomies hop last night, and after receiving the sweetest mini mini from Allison from Campbell Soup Diaries as part of the mini mini quilt swap (Check out #miniminiquiltswap on Instagram to see all the creative fire this little project is sparking), and see Allison’s tutorial for this mini here. The topic of conversation was “Quilting Community” and our conversation ranged from a real live scope from a booming guild meeting, to reflections on why some of us modern quilters love the local traditional guild like family, all the way to “I make my own guild because I live too far from one—and you’re it”! We spoke about quilting conferences vs retreats, person to person interactions, and online relationships. As an experiment, and a little peek for those of you who may not have a smart phone, I’ve tried to save my video stream and post it here (embedded from youtube). Please note (and this is important!! ), in the actual Periscope stream, little comments appear at the bottom of the screen, so when I suddenly look closely at the camera and seem to reply to someone, I’m actually replying to someone! I’m not crazy, I promise! The video I saved to my phone doesn’t save those comments or the stream of hearts indicating when something I say resonates with viewers especially deeply. So here we go: my real-time, un-edited, late night with a sick baby in the next room, take on quilting community and what it means to me. I hope this works. The human connection is so essential to most people, and I’m grateful for the relationships I’ve helped foster over the past couple of years. Allison is one of those with whom I’ve been conversing through blog comments and resulting emails for almost as long as I’ve been blogging, so of course I was game for swapping mini mini quilts with her. We agreed that we were both busy, so the timeline would be relaxed. A day or two later (or less?) she wrote back, “I was inspired. I made your mini.” Little did I know how sweet the two (2) minis would be! The fabric choices alone make these immediately awesome in my book. Allison clearly knows my favorite designers–Carolyn Friedlander (with some of that much coveted Architextures that I never did get my hands on–swoon!) and Alison Glass. Is that the sweetest thing, or what?! I’m still stitching my love into the mini mini I’m making in return for Allison, and I’m not sure I can come close to a creation as personal and beautiful as this. 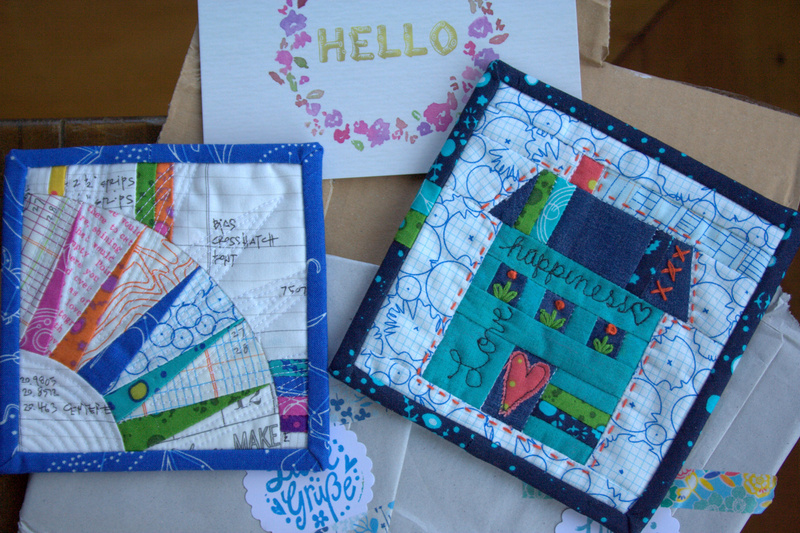 It will still be a mini mini filled with love, and a little sign of how important my quilting community is–even across the world! Allison lives in Germany. Isn’t the internet an amazing thing!? Thank you to all of you, enjoy the Periscope hop if you have the capability and time to watch, and happy stitching! You are such a joy Kitty! I enjoyed your Periscope talk last night. I hope all is well with your kidlings too! Be well, and have an amazing day! Oh! I have a hubby like yours! He is totally involved in my quilting and other hobbies as well. Isn’t it wonderful? “The House Where Kitty Lives”- I love that! What a thoughtful gift! I listened in last night…my first attempt at using Periscope. Love your minis. This is the cutest mini ever! You must be feeling the love (you deserve it!). Thank you for such a nice blog post. I have noticed that since I am finally having the time to sew again (and the time to actually blog about it), that it has been increasingly more important to have a community too… who would have thought that such a community would include rural Maine and Northern Germany?!? I’m so glad you liked the mini’s and that it touched you so deeply… isn’t that what sewing is all about? 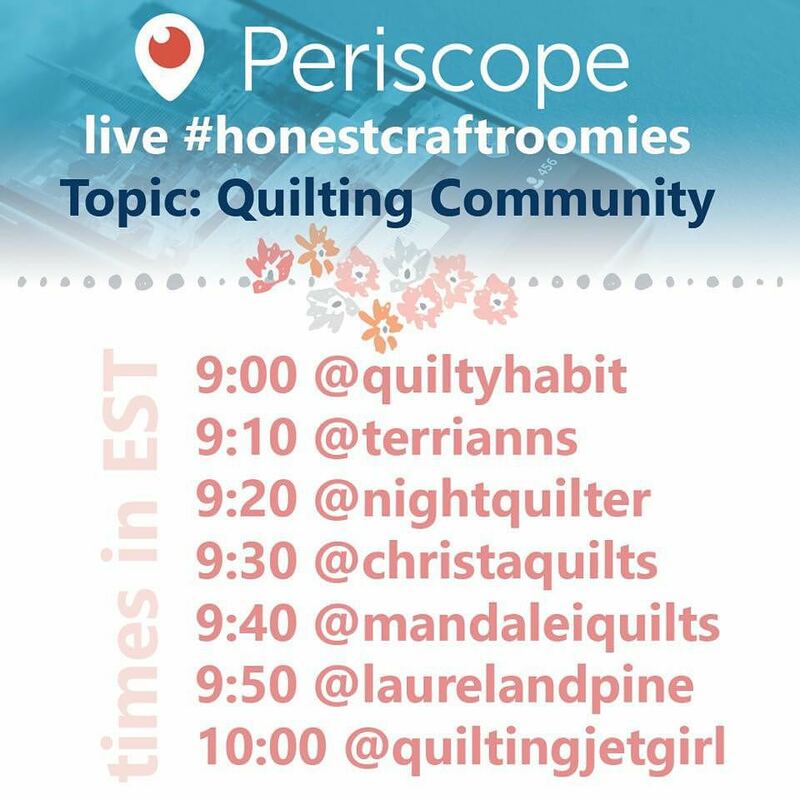 I’ve fallen in love with Periscope and getting to know all you ladies out there with the same interest in quilting. It’s become my community as I’m not apart of a guild (for multiple reasons). It’s great to see you and hear you speak about your passion. Looking forward to next week! That was so cool! Thanks for sharing the video. I so want to participate but periscope doesn’t have an app for windows smartphones. 😦 It’s funny how much this topic resonated with me as well. As a stay at home mom who’s moved around a lot (5 times in 4 years) I didn’t know any quilters other than those in our online community. 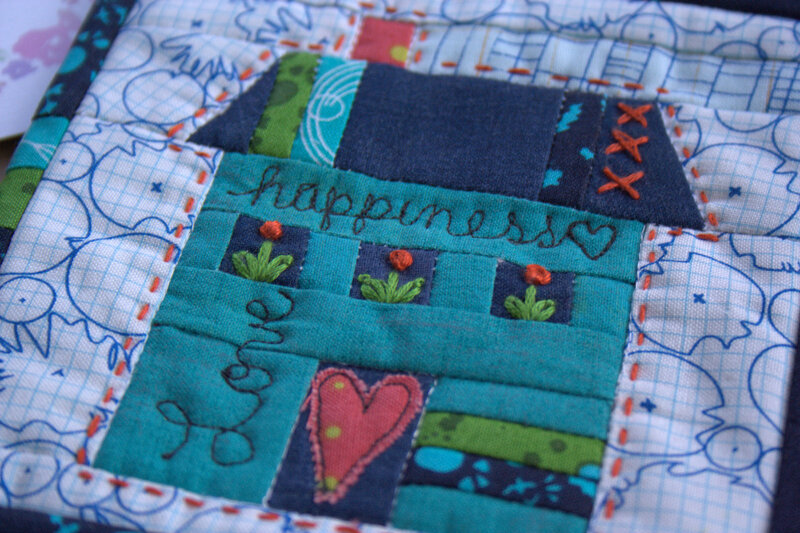 The 2014 New Bloggers group was my life-line and where I met so many of you that I call my quilting friends. Being from rural Maine, dang you still got to a lot of in-person quilting events! I’m so excited to be going on my very first quilting retreat in a few weeks. I finally live close enough (45 minutes away) to my local modern quilt guild and just joined this month, but I still consider my online community my first guild. And I completely forgot to mention how adorable those mini minis are from Allison. They are just so sweet! Allison’s minis are the sweetest things and so obviously show the care and attention she put into them. I’ll have to come back to watch the video. My supportive husband (and dog) would be woken by the sound if I played it now. Periscope is cool, eh? I have yet to try it. I would be nervous on film too.